Martin Anderson’s Toccata Classics is the musical equivalent of a specialist book shop whose shelves are lined with rare but rewarding titles. Indeed, browsing their stock is a sobering reminder of just how much worthwhile music there is out there, and how little of it is ever recorded. True, some of it isn’t too peripheral – take the Shostakovich Piano Duos and Duets I reviewed recently – but it’s the kind of repertoire that the majors tend to ignore. And Toccata show their commitment to a given composer by initiating complete cycles; Volume 1 of Ernst Krenek’s Piano Concertos, which I reviewed last year, is the start of one such project. 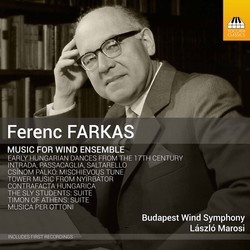 Does the music of the Hungarian composer Ferenc Farkas deserve the same treatment? Toccata certainly seem to think so; indeed, of the 32 Farkas recordings listed by ArkivMusic eight are from this enterprising label. I was astonished by the breadth and quantity of Farkas’s output, which spans most genres, including film. What we have here is a well-filled album of music ranging from the 1930s to the 1980s. All of it is new to me, as are the Budapest Wind Symphony – described as an ‘elite ensemble’ whose players are drawn from Hungary’s best orchestras – and their conductor László Marosi. According to László Gombos’s invaluable liner-notes the Early Hungarian Dances from the 17th Century has its origins in Farkas’s score for the 1940s costume drama Rákóczi nótája (Rákóczi’s Song). The music was subsequently reworked for a variety of instrumental combinations. The five selections played here are in László Zempléni’s 2015 arrangement for wind band. And what a splendid quintet of dances they are too, all rhythmically alert and perfectly pitched. There’s an earthy ‘stomp’ in the livelier tunes and the slower ones are given a sonorous, suitably antic air. The Leaping Dance, a laugh-out-loud little number, shows the band at their virtuosic best. Even at this early stage it’s clear there’s a pleasing balance and blend to the playing – not a given with such groups, professional or otherwise. As for Marosi he’s firm, but not overly so, and that makes for buoyant, highly engaging performances. Tamás Horváth’s recording is very attractive too, with plenty of warmth, detail and a decent stereo spread. All these qualities are in abundance in Tony Kurmann’s 2013 arrangement of Farkas’s suite from his ballet The Sly Students, premiered in 1949. It’s a simple tale of a girl who ignores her father’s plans for her future and falls in love with a penniless student. And as with so much Hungarian music it’s all about the dance. I’m struck by how genuinely orchestral this arrangement sounds. The opening Fair in Debrecen finds the lower brass in delicious, fruity form, while the rest of the band are only too eager to take part in the fun. The slinky Air de danse is perfectly paced, as is the robust Students’ Dance, and the bass drum is nicely weighted throughout. What a thoroughly danceable score this is, and how inventive. The Gypsy Music is authentically animated and the jazzy Pas de deux is superbly realised. Even the rumbustious Finale, at more than five minutes, doesn’t outstay its welcome; that’s a tribute to the composer, the arranger, these polished performers and a conductor who knows just how this music should go. Farkas was nothing if not versatile, so it’s no surprise that he also wrote for the stage. His incidental music for Timon of Athens, the first of four Shakespeare commissions for the National Theatre, Budapest, is given here in Kurmann’s 2014 arrangement. The timp-driven Alcibiades’ March, both grave and surprisingly graceful, builds, Bolero-like, to a thrillingly martial close. And without impugning Farkas’s skills do I see Respighi’s Roman legions heaving into dusty view? The Dinner Music, with its piping and lute-like sonorities, is no less accomplished. As for the concluding Dance it wouldn’t disgrace a swords-and-sandals epic from Hollywood’s golden age. There’s no programme to two of the remaining pieces, both in the composer’s own fair hand. Intrada, Passacaglia, Saltarello and Musica per Ottoni, the latter a Hungarian Radio commission, date from 1982. Supremely well crafted, they show Farkas very much at one with his material and the instruments required to play it. There’s glorious weight and some delicacy in the first piece, in which the unanimity and character of this band really shine through. And what a nicely articulated Saltarello, blessed with plenty of lift and a strong sense of purpose. Once again the ‘hear through’ recording reveals so much detail; just sample the two outer movements of Musica per Ottoni, where individual players get a chance to strut their stuff. Like Respighi Farkas delighted in music of his own, distinctive past. Contrafacta Hungarica, which draws from 18th-century manuscripts, was originally composed for string orchestra but was then reworked for wind band. Textures are light and transparent, and that allows instrumental strands to de discerned with ease. These players also have no problem switching idiom, from supple modernity to the grace and gravitas of a bygone age. As for Tower Music from Nyírbátor, written for the inauguration of a Hungarian music festival in a town of that name, it has all the pomp and presence one associates with a very public piece. The interplay of melodies is masterly, the trumpet fanfares splendid. With this band it’s all so tastefully – so musically – done. And on the premise that it’s always best to leave one’s audience wanting more the infectious Csínom Palkó (Mischievous Tune) is the best sign-off imaginable. With its roots in a radio play from the late 1940s, the version played here is Kurmann’s arrangement of an earlier one by János Eördögh. Even at two removes this is music of pure delight; indeed, it has one of the loveliest, most innocent little melodies I’ve heard in ages. The playing is both happy and heartfelt, and Marosi keeps it moving along so well. It’s a feel-good piece which, like all the others in this collection, gets the strongest possible advocacy from all concerned. And that’s just how it should be done. Toccata really do have the magic touch when it comes to less-familiar repertoire; huzzahs all round!